It’s been hard enough trying to squeeze in a few hunts here and there, but a month without a blog post, and folks just assume I’ve hung up my machine and retired. So, um… well, FYI, that’s never going to happen! It is what it is, and the reality is that I can’t always be lost in Detecting Wonderland. Sometimes I have to do things that are more important than metal detecting (omg-did I really just say that)? But finally, I’ve locked in some time for me, and today I’m heading down to Andora Farm in Culpeper,VA, for a three day Civil War hunt. It’s been a few years since my last Virginia hunt, so I’m really looking forward to it. My only expectation is that I’ll be doing what I love to do most for three straight days. I’m bound to find something, at least some three ringers, and if its only some bullets, that’s okay, ’cause next to Indian heads, and any silver coin, three ringers (I don’t know why, I just like ’em) are high on my list things I love to find. But whatever the outcome, I’m sure I’ll have something interesting to tell you all when I return. And since I don’t always have time to post my finds on Facebook, or write super interesting blog posts to entertain you, here’s a few pics for your viewing pleasure–enjoy. I have found these guns before, but never found one totally intact. Its also a good example of why you should always detect the roots of fallen trees. Do you think anyone would get upset if I decided to “open carry” this into Target? I also found a holster for it, but I have to wonder why would someone leave their holster in the woods? Maybe it was been left by an archaeologist guarding the site from button thieves? My very own iron paintbrush! The first of its kind I bet. This was in my garbage bucket, but my guy took it because apparently it goes to an anvil. Who knew? Well, he did, and it made me feel good to see him so excited over it. 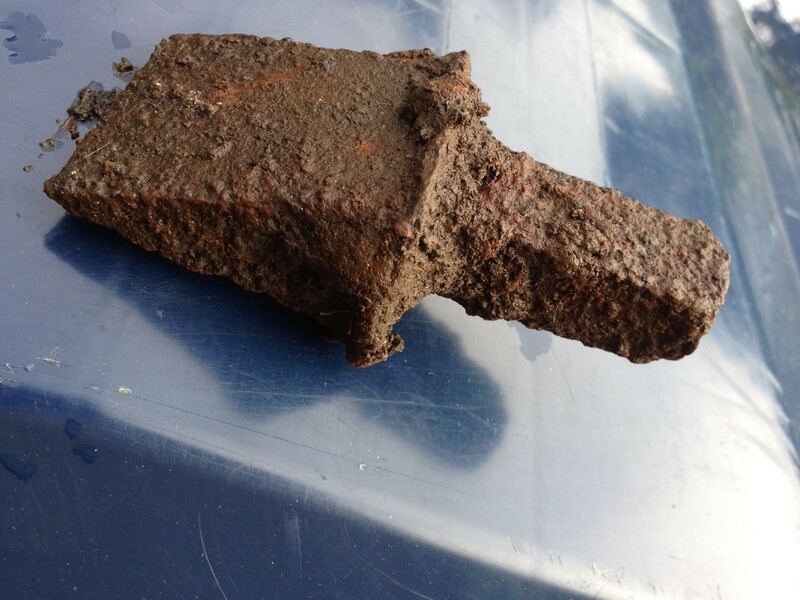 Found in my garden–you didn’t think metal detecting was my only hobby did you? Yes, its a smushed cup with Jesus’s face on it. Whadda ya mean you can’t see it?? And just how do the Metal Detecting Gods know 23 is my favorite number? This rusty relic says guaranteed, so I better hold onto it. Expert oxen shoe finder for hire-yup, that would be me! You’re welcome Dennis. Yup, sometimes things just don’t work out the way you want them to, crazy year for detecting, either doing a lot of it at once, or nothing at all. I also wondered why you were not posting. Sometimes life and work gets in the way of prospecting. Ah well, sometimes you have to fight for your time. Thankfully, there’s nothing crazy on the calendar for the near future. Yep, your usual great read. Nice finds too…but that pistol looks as though it’s ‘cocked’. Was it loaded? I found a Civil War bullet of about .57″ caliber near Gettysburg some thirty years ago. It has a ‘star’ imprint on the base, which someone told me was a Confederate round. Thanks John-It may have been loaded with toy caps, because it is a toy gun 🙂 I don’t have my bullet reference book nearby, but that sounds about right. I’ve found a few with stars on them too. I love finding them, stars or not. Believe this or not, but I’d sooner find US Civil War relics than any roman stuff. Is the ‘star’ on the base of the bullet, do you know, US or Confederate? The most interesting part of the find was for me, that the bullet was deformed from hitting (presumably) the ground having been fired in anger. It is my most treasured find and kept proudly in my lounge cabinet. Have a peek at my latest on Stouty’s blog.